With the walkway expansion comes the removal of the temporary metal ramp as it allows pedestrians direct access via Centennial Walkway. To access the southeast side of campus, pedestrians will still need to use the detour route through Adams Humanities, as the west fence line will remain at its current location through the duration of the project. 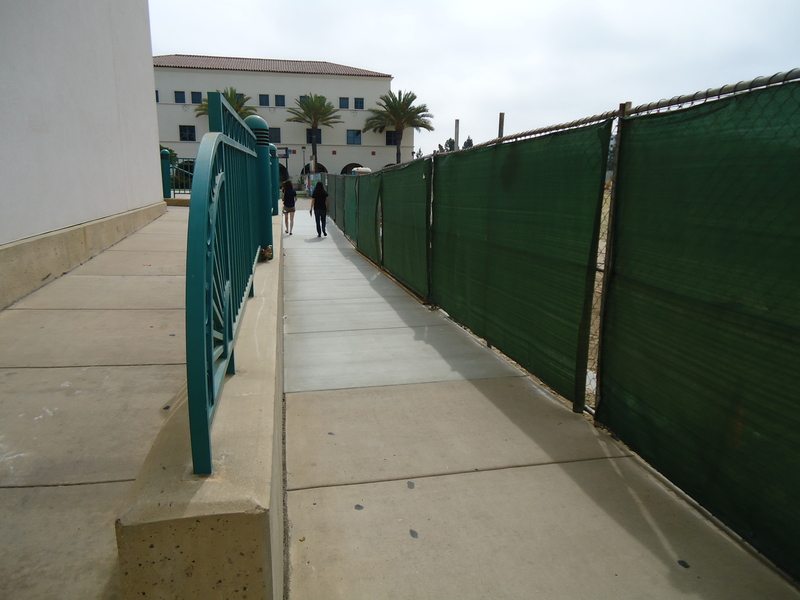 Speaking of the southeast side of campus, the ramp leading from the pedestrian bridge into Aztec Student Union has been fashioned. And it’s a “feat of engineering” considering its cantilevered shape and unique needs due to its location. 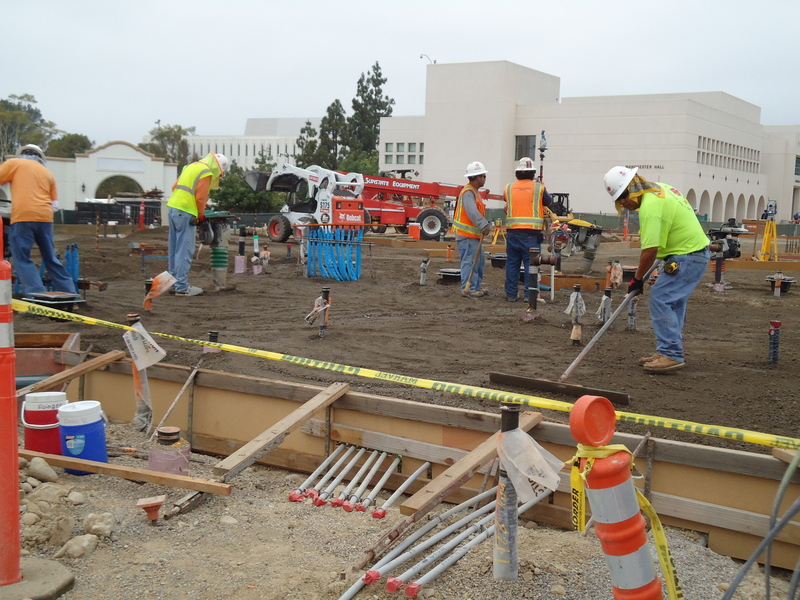 When complete, pedestrians will be able to walk right into Aztec Student Union from the bridge, where they’ll first encounter STA Travel and a yet-to-be named restaurant. And, on the opposite side of the building from the bridge entrance will be the new Aztec Lanes (in the top right of the below photo), where Aztecs will be able to enjoy bowling and other games. While it’s hard to imagine more “walkable” concrete on the site, there are still areas that could use it. For instance, this area, which serves as the “back of house” (or kitchen in non-food service lingo), was prepped last week for its slab on grade pour (i.e., the floor). The project crew compressed the dirt throughout the area, while keeping clear of the various bits of pipe and plumbing sticking out of the ground. Now, that area (and much more) is swathed in a bright yellow “vapor lock” that protects the ground below the slab on grade level from moisture. 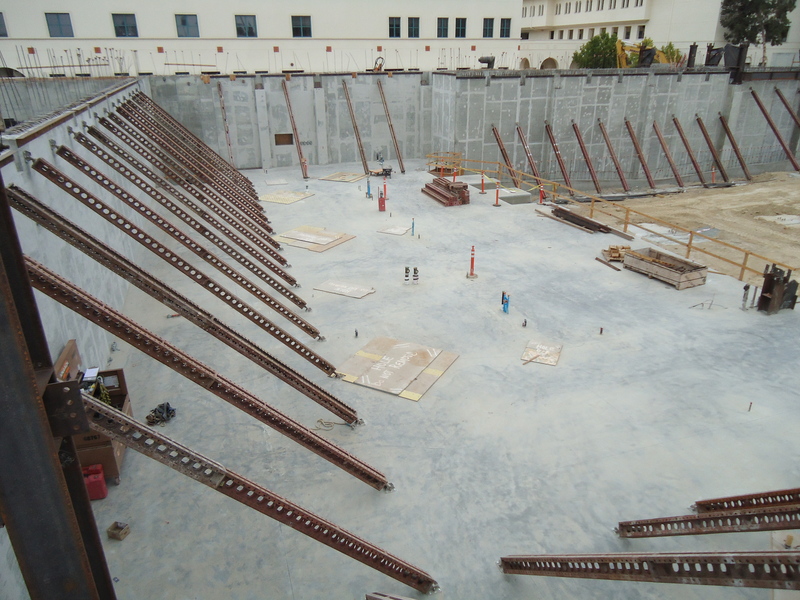 If you’ve looked at the construction cam on the Aztec Student Union website, you’ll see a lot of yellow. 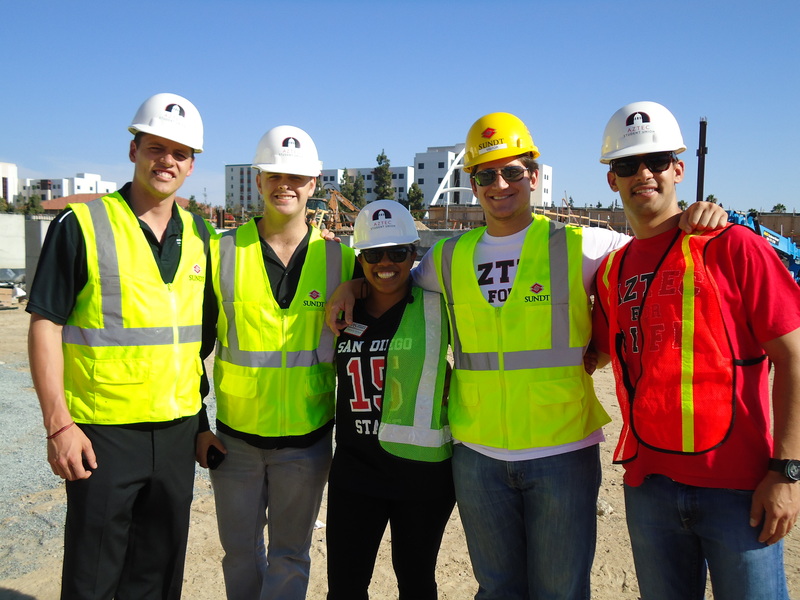 Lastly, this year’s A.S. executive team went on a walking tour of the construction site. It was a nice afternoon (if a bit hot and humid), but they’re excited to watch the project go vertical when steel erection begins in two weeks. 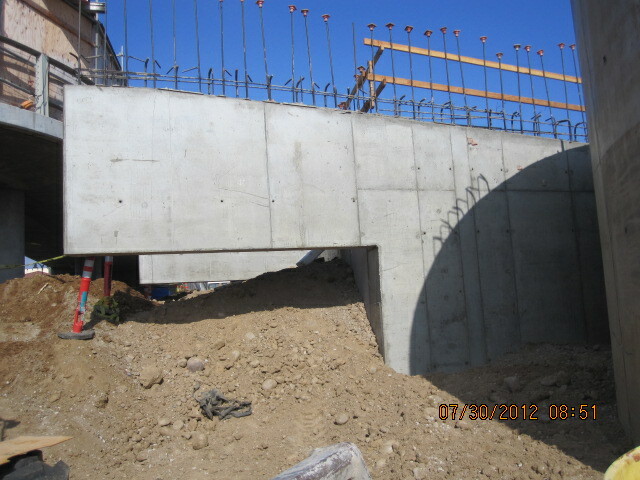 Thanks for a look behind the scenes of the Student Union construction!